Last minute travel deal cyber sale! +Restrictions apply. ++Kids Stay, Play and Eat Free applies to hotel only and must pay transfers, airfare and any applicable taxes. 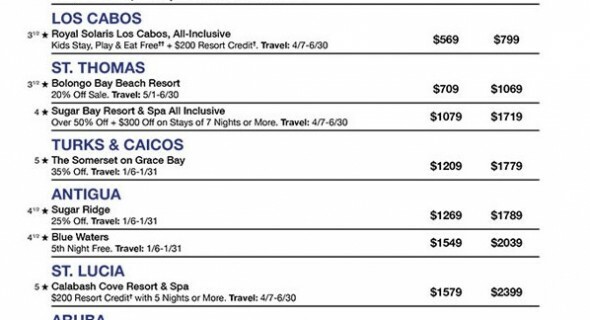 *Advertised prices available for bookings made electronically through your travel agent or on vacationexpress.com; small service fee of $10 applies when booking through Vacation Express Call Center. Prices are per person, based on double occupancy using lowest season hotel rates and lowest applicable airfare at time of publication. 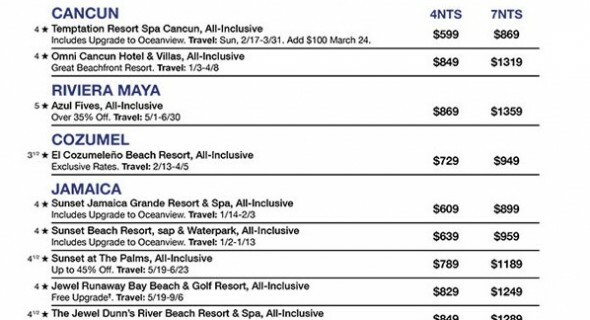 Four and seven night package pricing based on scheduled airlines from Miami or Ft. Lauderdale to Cancun, Riviera Maya and the Caribbean; to the West Coast of Mexico and Central America based on departures from Los Angeles, New York or Houston. Vacationexpress.com offers vacation packages from all US cities on most major airlines. For full terms and conditions, hotel and description of all services, please refer to the Vacation Express 2012 Brochure or visit vacationexpress.com. Some upgrades are subject to availability upon check-in. Packages at the above prices are based on select departure dates, are limited and are subject to change without prior notice. Vacation Express public charter flights operated by Sunwing Airlines and AeroMexico Airlines. Book by 12/26/12. Not responsible for errors or omissions.